From a small workshop in Manchester that looks more like a cross between a second-hand bookshop, a set from 'Delicatessen' and the kind of place "where the old man lives", I craft one-off individual custom guitars, effects pedals & pickups by hand. Each guitar is unique; no two alike. All my pickups are hand fed & scatterwound on a Heath Robinson type contraption that does the job beautifully. All scratchplates are custom-made for each guitar, all custom guitar bodies are cut, routed, sanded, finished and oiled by hand. I even give each one a loving polish with a dry lint cloth before cracking a mini-bar sized bottle of Single Malt over the hull and letting it set sail. On a dry day, you may even see me drag all the tools out into the alleyway and set-up bench on the cobbles, the buzz & clang of the router harmonising with the bell of the off-licence door and smell of the chip shop that wafts, Lowry like, over these northern terrace roofs. It takes a while to craft an individual custom guitar, that's why I only produce a couple each month. Not every month - sometimes its raining. Have a wander around the site, poke your nose around the pictures then sign-up and be one of the first to know when a new guitar is ready to go - could be around lunchtime, could be 3 in the morning but it will be posted here first. Kick your shoes off - have a look around. Based in my workshop in Manchester, I offer custom pickups, pickup repairs, upgrades & rewinds as well as pickup installation and an electrics upgrade service. Get in touch if you'd like me to have a look at your guitar. 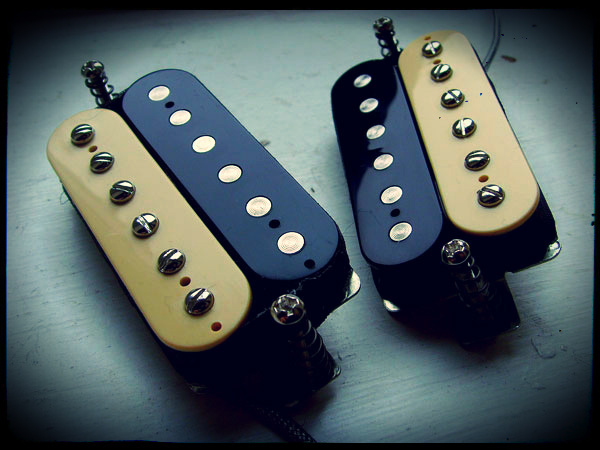 All my handwound pickups are custom made, often to customers own specs when ordered. I don't have a shelf full of pickups all boxed up ready to send, each order is carefully custom made so when you order pickups from me, they can be made to your own specs or suited to your own guitar or style of playing.